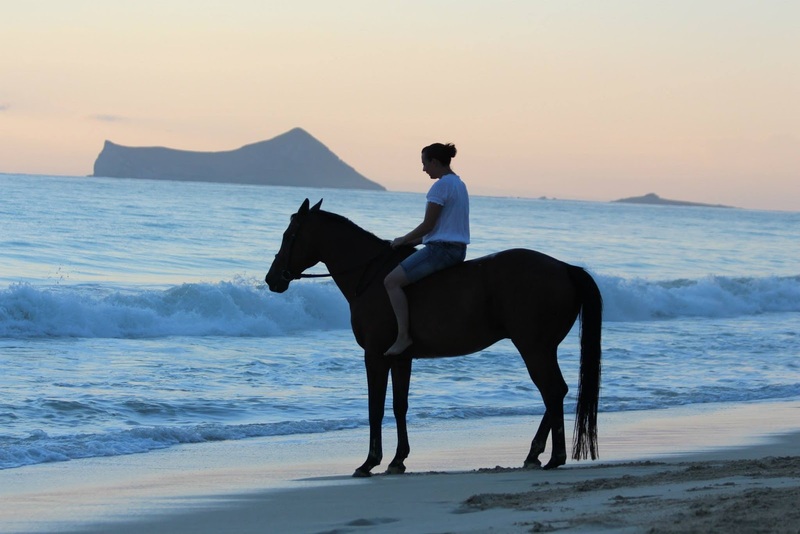 Confessions of a Dressage Barbie: Beach Ride! The last time I was in Hawaii, in 2014 for my grandfather's memorial service, we met up with a high school friend of my mom's -- she was running a boarding barn on the island and teaching lessons. I'm not sure how it came up, but the friend offered to take my mom on a beach ride, and naturally my mom dragged me along as well. (side note: I was positive I had written about that ride for a #TBT post and was gonna link to it, but apparently I imagined that, so I guess I'll add that to my to-do list!). It was a wonderful experience and really helped me to balance out the grief of that trip, and I'll always be grateful. I spent the morning riding a gorgeous bay OTTB named Rambo, who reminded me a lot of my Jack. Of course when we made plans to visit the island again, I made sure to reach out to my mom's friend (we'll call her L), to let her know we'd be in town. I had no expectations of another beach ride, but I was hoping I could come visit her barn at some point to get my "horse fix" :) she told me she was in a different location, but to touch base when we arrived and we'd make some plans -- so naturally, I did! She set up another beach ride -- how could I say no? She had a friend who had been wanting to take her first ride on the beach, and she figured my visit would be the perfect low-key time to get us both out there, and I could use her super-experienced guy to pony the other horse in a little -- and since I was riding, this would give her the benefit of being on the ground in case anything went awry. And of course we'd have DH there to document the whole thing with my nice camera! Win-win-win! Cheesin' so hard. I could not stop grinning the entire day. Last time we were there, our cabin was conveniently close to the beach we were riding on. This time, not so much. I set my alarm for 4:45 to get up and make the hour-long drive over to the beach before sunrise. We met up and hit the beach, letting Rambo get warmed up and getting the other horse used to the sound and the sight of the water. The other horse was naturally hesitant, but her rider stayed cool and calm, and eventually not only was she happily splashing through the waves with Rambo, but she figured it out on her own and headed out chest-deep in water -- a real sea horse! A quiet moment petting Rambo and thanking him for cheerfully toting me around all morning. Getting the hang of this water thing! <3 the light in these shots. It was so tricky to work with, particularly since DH is not a pro, just twiddling the settings on my camera. But he did an admirable job! Eventually the sun finished coming up, and we reluctantly headed back to the trailer. L sets up most of her beach rides for sunrise, knowing that the beach is more or less vacant of tourists at that time, so the horses don't disturb anyone. Although towards the end we were getting photographed by some other random passersby on the beach, so I'm sure I'm unknowingly going to be in someone's vacation album, haha. After we loaded the horses back up, DH and I followed L and her friend back to the stables to get the horses bathed and put away, and just hang out and talk horses for a while! We compared horsekeeping costs on the island to where we live in the Midwest (spoiler alert: it's cheaper here, haha), traded stories about when my mom and L used to ride together as kids, I shared photos of my girls, and we generally just had a great time. Eventually DH and I did have to drag ourselves away to head back to the cabin, but it was a wonderful morning. It made my trip exponentially better, and I hope if we're ever in the area again, we can drop by and hang out some more! It was another of those once-in-a-lifetime experiences, and I'm so grateful for L to making it happen not once, but twice for me now. I am forever in her debt! oh that was so wonderful. When we go to Hawaii (maybe next year) i am going to get information from you about that cabin- I'd rather stay in something like that then a hotel! Hawaii is great, you'll love it! Unfortunately I'm not sure how helpful I can be regarding the cabin -- the ones I've always stayed at can only be rented by active duty or retired US military members :-/ but I'm sure there are other cabin-type rentals out there! Ahhhh that looks AMAZING. Very jealous!! Whhhy is it so expensive to go to Hawaii? It looks and sounds amazing. Dude tell me about it. Just the plane tickets to Hawaii were about the equivalent of what we spent on the entire trip to Puerto Rico in 2016 😶 and the time change back and forth is so much worse, haha. Or warmer, as it were 😋 haha. I would love to live close enough to the beach to do this regularly, so fun! I know, it was the perfect storm of amazing to work out just right. I'm so glad I have the photos to commemorate it forever! omg so jealous! That looks like so much fun! It was definitely a one-of-a-kind experience!! Possibly the most epic pictures ever! So pretty. I love riding on the beach, but neither of my equines will step foot in the water for fear of instant death. That was the best part for me -- I loved rambo when I met him back in 2014 so getting to ride him again was so cool!! He's a doll. It was an insanely amazing experience, I wish beach riding was more accessible to more people! WOW what a dream!! So jealous, what an amazing horse connection to have in Hawaii! This is on my bucket list - I love it! 12/10 would recommend. I know several people who have ridden in Jamaica and Mexico and had a great time!! !